Tetsujiro “Tex” Nakamura, a civil rights advocate who became involved in redevelopment issues in Little Tokyo after World War II and an attorney who worked closely with attorney Wayne Collins on the World War II Japanese American renunciation cases, the Tokyo Rose case and the Japanese Latin American cases, passed away on Sept. 7. He was 98. “Mr. Nakamura was a civil rights hero, who worked tirelessly with Wayne Collins and the Tule Lake Defense Committee to reverse the injustice of the Department of Justice’s renunciation and deportation program — a program that stripped U.S. citizenship from nearly 6,000 Japanese Americans segregated at Tule Lake for the crime of protesting their incarceration. Nakamura was born in San Francisco Chinatown, the second son of Kichisuke and Koto Yamamoto Nakamura, both of whom were from Hiroshima-ken. When Nakamura was around three, his mother passed away from complications of appendicitis, and his father married Shizuyo Masumoto from Yamaguchi-ken. During his junior high school years, Nakamura gained his nickname after his teammates started kidding him as the “Texan” because he was one of the shorter players on the basketball team. This was later shortened to “Tex” since it sounded similar to a shortened version of his Japanese name, Tetsujiro, which non-Japanese found difficult to pronounce. Nakamura graduated from UC Berkeley in 1939 with a bachelor’s degree in political science. Since he was bilingual in Japanese and English, he had plans to pursue a law degree to help the Issei, who faced discriminatory laws and language barriers, but he put his legal education on hold and entered the work force to save enough money for law school. When the U.S. entered World War II and all people of Japanese descent on the West Coast were ordered into U.S.-style concentration camps, Nakamura’s family was first sent to the Walerga Assembly Center in Sacramento and then to the Tule Lake War Relocation Authority camp just south of the California-Oregon border. 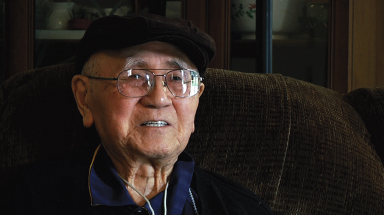 The Nakamura family remained in Tule Lake when it was converted into a segregation center. He worked in the camp’s legal aid department and found himself at the center of the renunciation issue in 1944 when President Franklin Roosevelt signed Public Law 405, which allowed U.S. citizens, in time of war, to renounce their citizenship upon the approval of the attorney general. The government had passed this law in order to legally deport U.S. citizens of Japanese descent to Japan. Fear and confusion ran rampant in the camp, which resulted in mass renunciation among the Tuleans. Many renounced their U.S. citizenship out of anger at the U.S. government or fear that their families would be separated, or even hope that they could wait out the war in camp. When many started voicing a desire to reverse their renunciation, Nakamura contacted Ernest Besig of the San Francisco ACLU office, who, in turn, introduced Nakamura to Wayne Collins, who agreed to take on the renunciation cases. To pay for Collins’ legal fees, Nakamura organized the Tule Lake Legal Defense Committee. Collins was able to halt the immediate deportation of an estimated 4,700 renunciants in 1945, but it would take another two decades and the filing of more than 10,000 affidavits to restore the U.S. citizenship of the renunciants. Nakamura also helped Collins halt the deportation of Japanese Latin Americans who had been forcibly brought to the U.S. to be used in hostage exchanges between the U.S. and Japan, and he traveled to Japan to gather affidavits and testimonies for the trial of Iva Toguri D’Aquino, a Nisei who lived in Japan during the war and was accused of broadcasting anti-American propaganda as Tokyo Rose. In his personal life, he married Lily Yuriko Yoshimi, a renunciant who had worked as his secretary at the Tule Lake legal aid office. Nakamura passed the bar exam and started his own practice in Little Tokyo. When City Hall threatened to bulldoze Little Tokyo out of existence through eminent domain proceedings, he became active in redevelopment issues. In addition, he was involved with the Los Angeles Hompa Hongwanji (Nishi Hongwanji) temple moving to a larger property site and the construction of the Hiroshima Kenjinkai office building. 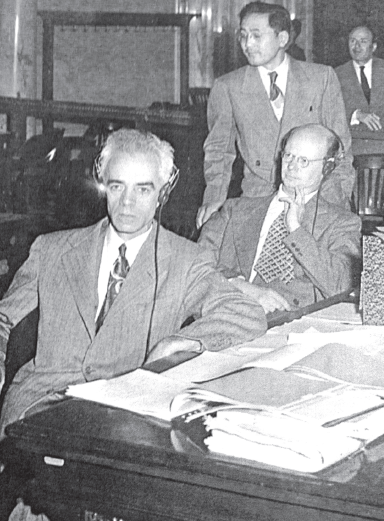 Tex Nakamura with civil rights attorney Wayne Collins in 1946. Nakamura organized the Tule Lake Legal Defense Committee and worked with Collins to restore U.S. citizenship to renunciants. Tsutomu Maehara, 96, who has known Nakamura since right after the war, described Nakamura in Japanese as a man of few words but very honest. Maehara, who was treasurer on the Nishi Hongwanji board, worked closely with Nakamura, the temple’s pro bono legal advisor, and Masashi Kawaguchi of Fish King fame, who was then Nishi board president. The three were instrumental in raising funds so that Nishi could acquire and move the temple to its current site. Hiroshi Kashiwagi, another renunciant, voiced similar sentiment. “At first, I was kind of suspicious of him because he was not a renunciant himself, and yet, he was helping us,” said Kashiwagi. “I was wondering what his motive was, but he really did a lot for us, and I appreciate everything he did. He was really interested in our welfare. Bruce Hatakeyama, whose father, Isao, was a renunciant, initially did not know that Nakamura had been assisting renunciants such as his father. He had met Nakamura since they both attended Nishi Hongwanji. Nakamura is survived by four sons and one daughter; many grandchildren; and a great-grandchild. Funeral services will be held on Friday, Sept. 18, from 7 p.m. at Nishi Hongwanji, 815 E. First St., Los Angeles. Burial services will be held the next morning at Evergreen Cemetery, 204 N. Evergreen Ave., Los Angeles, at 10 a.m., followed by otoki or memorial service meal.